Nomans Land was formed in Saint Petersburg, Russia in spring 1996. 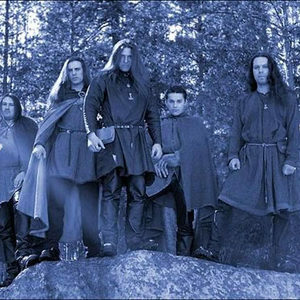 Initially the group focused mostly on Doom Metal but in the course of its formation the concept underwent a big change and became Viking Metal. By the end of 1999 Nomans Land was fully prepared to start up the full format album and in summer 2000 they recorded it in Signal records studio (Russia). The album was called "Last son of the fjord" and was released by Fono Records (Russia) the same year. Right after the debut album was ready the drummer and bass-guitar player left the group; however, in almost no time these vacancies were taken by Ainar (drums) and Hjervard (bass). Since that moment the permanent band musicians were Sigurd - Guitar/Vocal, Torvald - Guitar, Ainar - Drums, Hjervard - Bass. The group starts its intense performing activity in Saint Petersburg clubs and takes part in big variety of local music festivals. The whole year 2001 was basically dedicated to accumulating the material for the second album. Creative atmosphere made them come across an idea to enrich the sound by keyboards, so they invited their good friend Igor Pelekhaty to participate in the recording. As a result of this cooperation they came up with 10 compositions and started the recording work for the new album "Hammerfrost" in Calypso studio, summer 2002. Besides, not long before that the new singer Wild (screaming stile) joined the group. By March 2003 the album was ready. Meanwhile, Nomans Land keeps having its concert activity, and as the session keyboard player, Ilya Denisov joins group. Nomans Land starts looking for the label for releasing their new album "Hammerfrost" and in the course of negotiations arrives to an agreement with German based label Einheit-Produktionen. At the same time the group found itself in the middle of technical and creative disagreement and had to say goodbye to Wild, and it didn't take them long to make a decision: Hjervard approached the microphone. 21st February 2005 "Hammerfrost" was released in Europe by Einheit-Produktionen. Shortly after that the album receives a very good press and high opinions in many different magazines. In July same year Nomans Land is invited to take part in the "Ultima Ratio" festival in the town of Essen (Germany). It was their first performance abroad. March 31st 2006 Einheit-Produktionen released the second edition of group's 1st album "Last son of the fjord" in Europe. This time CD had the concert video of the band in "Arctica" club in Saint Petersburg (Russia) as a multimedia bonus. In April the band performs in "Ragnarok-3" festival, Lichtenfels, Germany. In spite of these activities Nomans Land never stops working at their 3d album and in July they commenced recording new material in "Phantom Pain" record studio (Saint Petersburg, Russia). Once again Igor Pelekhaty is invited to participate in composing and recording the keyboards part besides Ilya Denisov (keyboards) was also involved. Soon after the recording was over the band loses Torvald. He leaves pleading serious tiredness and some others personal problems. The new band's opus gets the name "Raven Flight" and consists of 11 compositions. After 6 weeks of hard work in the recording studio the band goes to Germany "Thrudheim" studio to do mixing of the album. The work was performed by Christian. Mastering was made by Alex in "Sound Art" recording studio, September. Nomans Land was getting ready for their concert activity in support to their album "Raven Flight". They had two tours aroung Europe with their German brothers Thrudvangar and Czechs Trollech. At this moment the brave Russians commenced the works for their next record ?Farnord?, for which everybody involved had an exorbitant high quality in mind ? in terms of song material as well as production values. First audio samples completely confirm full success, phenomenal Viking Metal anthems have been composed, previously known only from Nomans Land themselves. Catchy melodies, majestic and superior clean vocal passages and top-notch instrumentation inevitably fascinate with pure magic. The new killer record was produced at the renowned Sevik Audio Studio in Finland where the creative body received a grand sound design. Currently a fine tour featuring Obscurity, Thundra and Kromlek is in the planning stages. Release date will be August, 29th and demanding Viking Metal fans can already look forward to one of the greatest albums of all time in this genre!